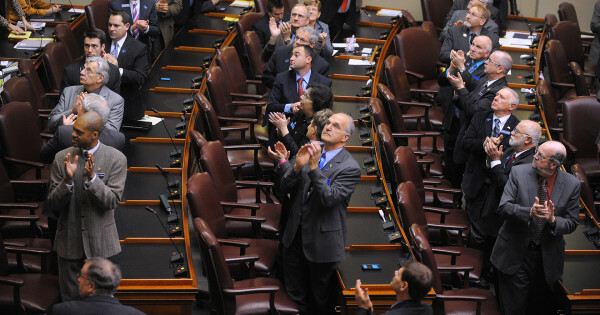 Members of the House of Representatives acknowledge guests in the balcony before Gov. Paul LePage's 2014 State of the State address in February 2014. Do you want to change Maine law to allow publicly financed state candidates to qualify for additional funds under certain limits and rules in the Maine Clean Election Act, to improve the disclosure of who pays for political ads, and to increase penalties for violations of campaign finance law? In 1996, Maine voters said yes to leveling the financial playing field in elections. The result was Maine’s clean election system, under which candidates for state-level office could qualify for public campaign funds. Those who qualified could spend election season appealing to all voters, without paying special attention to those with the resources to contribute to a campaign. For better or worse, money is a critical component of most successful campaigns, so public campaign funding is the leverage the public has to keep elections open to all viable candidates; to keep those candidates focused on voters, not donors; and to keep, as much as possible, those campaigns low-cost affairs. Voters can have confidence in knowing a publicly financed candidate, once in office, isn’t grappling with that nagging, back-of-mind thought that a particular decision could disappoint a campaign donor. But much has happened since 1996 to threaten the Maine clean election system’s viability. Question 1 on the Nov. 3 ballot proposes many of the updates needed so candidates can use clean election funding to run competitive races. It includes a range of other necessary campaign finance reforms. We urge a “yes” vote. If Question 1 passes, clean election candidates will be able to unlock more resources to wage competitive campaigns if they put in the effort. In addition, governors-elect would have to disclose who is trying to curry influence by contributing to their transition committees, political committees and candidates who file campaign finance reports late would face steeper fines, and political committees trying to influence Maine elections would have to disclose their top three contributors in advertisements and mailers. For about a decade, Maine’s clean election system mostly worked as intended. Research examining Maine Senate elections found that public funding made it possible for more viable challengers to step forward, making more legislative races competitive and reducing the incumbent advantage. But in 2011, the U.S. Supreme Court invalidated a key part of the program: matching funds, which allowed a publicly financed candidate to qualify for additional money if a privately financed opponent’s fundraising exceeded a certain level or if an outside group spent money either to oppose the publicly financed candidate or support his or her challenger. Clean election participation has since dropped: Just 53 percent of legislative candidates used public financing last year, down from 81 percent in 2006 and 2008. The absence of matching funds — and, as a result, a publicly financed candidate’s ability to respond to a deluge of opposition spending — means there’s one less deterrent to prevent an outside group from dropping large sums of money into a legislative race. Question 1 opponents have repeatedly and falsely claimed that the ballot initiative would increase “welfare for politicians” by 300 percent. Either they can’t do math or are deliberately misleading voters. In total, the ballot initiative would raise annual clean election funding to $3 million from the current $2 million — a 50 percent increase. It’s true a legislative candidate who in 2014 qualified for $4,724 for a House election or $21,749 for a Senate election could next year qualify for up to $15,000 and $60,000, respectively. But that’s still not a 300 percent increase. It’s also an incomplete comparison. Under the clean election initiative voters approved in 1996, total available matching funds were worth double the initial payout. If matching funds were still available in 2014 — as they were from 2000-2010 — the total available, general election payout for House and Senate candidates would have been $14,172 and $65,247, virtually the same amounts as Question 1 proposes. Plus, it’s inappropriate, hyperbolic and insulting to denigrate the funding as welfare. When matching funds were available, targeted candidates automatically would receive them once their opponents raised or spent more money. Under Question 1, candidates would have to take on the extra work of finding more qualifying, in-district, $5 contributions for the Maine Clean Election Fund in order to unlock additional funds. Question 1’s funding mechanism — admittedly an imperfect one — would more than cover the increased cost of clean elections if lawmakers comply with it: They would have to comb through dozens of tax breaks deemed ineffective following evaluation by the Legislature’s nonpartisan investigative arm and eliminate at least $3 million annually. Some have suggested opposing Question 1 because it won’t stem the flow of big, outside money into Maine politics. Others have said the initiative is more appropriately the domain of the Legislature. Virtually the entire question, in separate parts, has been supported by the Maine Legislature. Gov. Paul LePage thwarted a number of these needed changes. We agree that Question 1 won’t excise money from politics, but it builds on a system that has proven successful in limiting spending in many races, lowering candidates’ financial barriers to entry and making more legislative races competitive. The disclosure elements of the question are critical, long-needed changes.